Choose to be the STAR you are! Welcome to Hamilton where we stand for success! We believe in engaging students in opportunities that will build their future, inspire life long learning, and develop a community of leaders by providing solid curriculum and a safe and nurturing environment. Student council Flashlight Team leads community service projects to improve the school and community in positive ways. Hamilton celebrates students positive behavior and teaches targeted behavior skills with whole school monthly PBIS assemblies. 81 Hamilton 4th graders participate in the Service and Safety Squad. View more images from this month! All of our Hamilton students got to go inside the Remax hot air Balloon to learn about how the pilot operates the balloon. Thanks, Remax for the great experience! Hamilton students brought a special lady to Muffins with Madames and enjoyed Muffins and Cider from Chef Tony before starting their day! It was great having so many special visitors to Hamilton! Kindergarten students in Mrs. Bares class are learning about how to ask good questions during buddy reading! Mrs. McBroom and her 2nd-grade students held their weekly community circle in the gym and shared this thought about doing your personal best which is our monthly spotlight behavior! The You Drive. Kids Thrive. program will support 5th graders going to camp and afterschool activities. 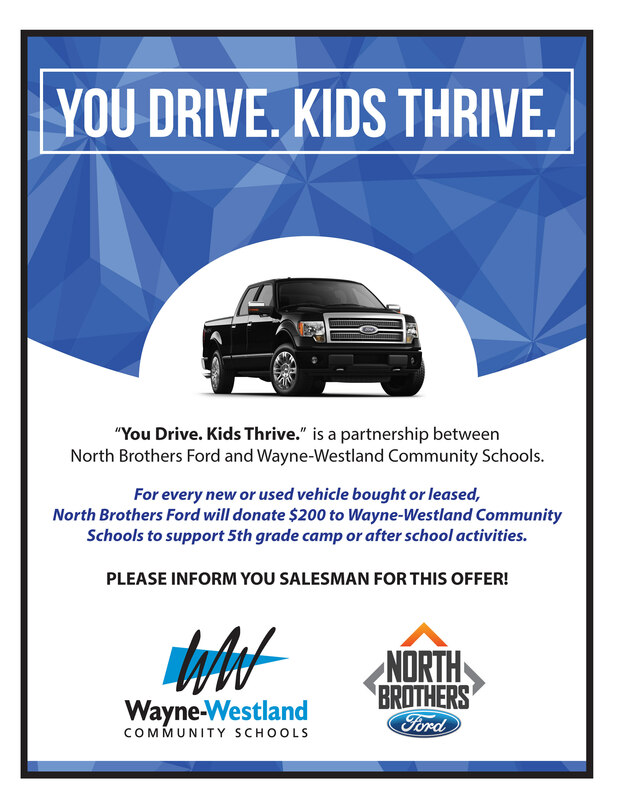 North Brothers Ford will donate $200 to Wayne-Westland Community Schools when individuals buy or lease a new vehicle. Stop in and visit North Brothers Ford today! Please inform your salesman for this offer. Thank you to Miss Michigan, Alyse Madej for visiting our 1st-grade students at Hamilton! Miss Madej read a book and talked to us about diversity, self-confidence, and kindness. Thank you to our student teacher Miss. Caitlyn Holliwell for inviting her to visit! Bring your favorite dude to school and enjoy a donut and juice before school!